RICHMOND, Ky. (WHAS11) — President Donald Trump said Republican Andy Barr, a Kentucky congressman, is a "fantastic guy" whose vote Trump needs to make America great again. 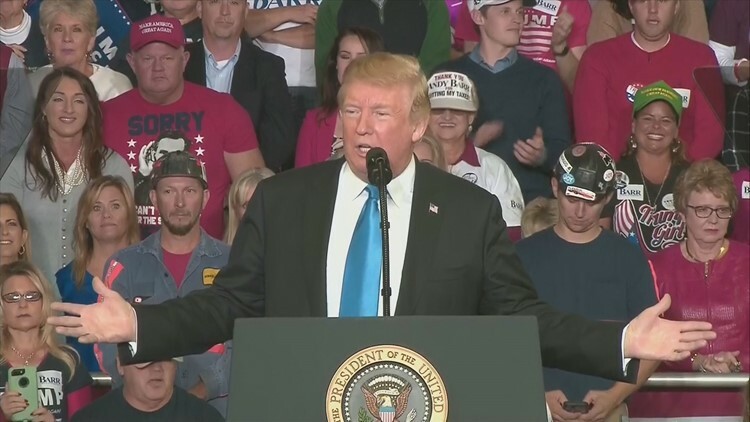 Trump held a rally in Richmond, Kentucky on Saturday evening to campaign for Barr, who's seeking re-election to a fourth term. Trump tweeted before the trip to Kentucky that Barr is strong on crime, tax cuts, the military, veterans and the Second Amendment. Heading to the Great State of Kentucky - Big Rally for Congressman Andy Barr - Fantastic guy, need his vote for MAGA! Strong on Crime, Tax Cuts, Military, Vets & 2nd A. His opponent will NEVER vote for us, only for Pelosi. Andy has my Strongest Endorsement!!! See you in Kentucky. Trump added that McGrath "will NEVER vote for us" and that Barr has "my Strongest Endorsement." Governor Matt Bevin and Senator Mitch McConnell greeted President Donald Trump upon his arrival at Lexington's airport. At the rally held at the Alumni Coliseum at Eastern Kentucky University, President Trump said America is the hottest country in the world, celebrating what he calls "an economy unlike any other in its history." Trump ticked off his administration's accomplishments in his speech, leading with the low unemployment rate. He's also assured Kentuckians that coal has come back. He's warned that Democrats only want to obstruct and says their "lust for power" drove them to be incredibly unfair to his Supreme Court nominee, Brett Kavanaugh. Trump also led for a rousing cheer for the state's senior senator, Majority Leader Mitch McConnell, as he celebrated his administration's first two years in office. President Trump's campaign said he will rally for GOP candidates in several critical Western states late next week.